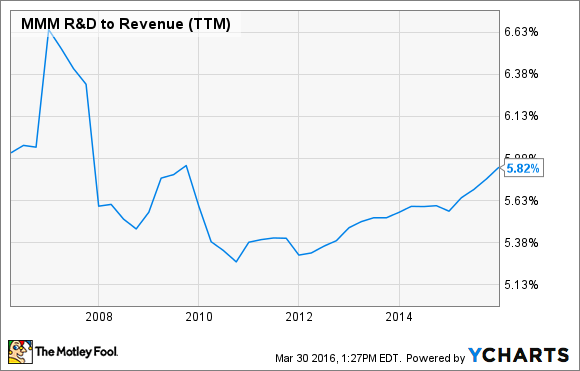 Does 3M Company's Guidance Make the Stock a Good Value? The industrial bellwether is a high quality company, but does its recently released five-year plan make the stock worth buying? On Tuesday, 3M Company (NYSE: MMM) reaffirmed its 2016 outlook and gave investors its five-year outlook. Following this announcement, the big question investors need to ask is this: How exactly are these companies supposed to generate strong earnings growth in a moderate economic environment? It's a particularly pertinent question, because 3M Company's new guidance calls for 8% to 11% annualized EPS growth from 2016 through 2020. Let's take a look at the company's new guidance and whether it makes the stock worth buying or not. In order to put this into context, here is what 3M Company's EPS will look like based on the guidance range given above. And here is what it means for its P/E ratio based on the current price of $166. As you can see below, it will be the end of 2017 before 3M's P/E ratio is meaningfully below 20 in either scenario. Incidentally, for those who prefer free-cash-flow (FCF) as a guide, then 3M's assumption of 100% net income to FCF conversion means you can simply use EPS as an approximation for FCF and calculate accordingly. That said, how is a company set to generate 2%-5% organic local currency sales growth going to generate 8%-11% EPS growth? Organic local currency sales growth was only 1.3% in 2015, and management is forecasting just 1%-3% in 2016. How can this be? The plan is to grow organic revenue at 1.5 times industrial production growth -- which 3M's management expects to be 1%-3% annualized from 2016-2020. To be fair, management's global growth assumption looks reasonable, and 3M has a strong track record of growing in excess of the market; however, the target puts some pressure on an already stretched valuation. Investing in growth is the aim of every industrial company, and 3M's impressive track record of generating ROIC in the range of 18%-22% over the last five years is a testimony to the company's ability to continue generating returns from its assets. However, there is a concern here. The plan calls for research & development as a share of revenue to average 6% in the next five years. As you can see below, it's an optimistic and speaks to the possibility that 3M Company is finding it harder to innovate and create differentiated products with which it can maintain industry-leading margins and productivity. Meanwhile, management is expecting acquisitions to add 1% to annual EPS growth as part of the plan. Repurchasing 3M stock is intended to generate 2%-4% in EPS growth in 2016-2020, but it comes at the price of increasing debt. Indeed, as you can see below, debt is forecast to rise significantly as part of the plan -- reducing EPS by 1% on average in 2016-2020. The fourth factor contains many moving parts. To put the figures below in context, 3M's 2015 revenue was $30.3 billion and net income was around $4.8 billion. Interestingly, all of these plans involve activities which aren't contingent on top-line growth, and suggest 3M can leverage moderate revenue growth into earnings growth without the help of the economy. Does this mean 3M Company stock a good value? In the author's view, no. 3M is a company with a very impressive management team, but its valuation isn't compelling on a risk/reward basis. On the positive side, around 3% of annual EPS growth is forecast to come from operational and productivity improvements and, given its track record, management can be given the benefit of the doubt on its plan to add 1% from acquisitions. On the downside, the company's margin and ROIC could come under pressure if it fails to innovate in a slowly growing economy, and relying on share buybacks for 2%-4% EPS growth while debt is increasing isn't every investor's favorite strategy. Throw in a forward 2016 P/E ratio of around 20 times earnings and 3M Company doesn't look cheap at $166.